Funnel Marketing FAQ's: Marketing Funnels Explained! Funnel Marketing FAQ’s: Marketing Funnels Explained! Raise your hand if you have a question about Funnel Marketing. Some years ago now, a revelation in marketing took place in the shape of a funnel. Today, you probably have one, whether you realise it or not. Don’t understand the term ‘Funnel Marketing?’ You may call it a “Sales Funnel,” “Conversion Funnel” – or a number of names. Whatever the terminology, if you have a business that is looking to make a profit, then you need a funnel. It’s pretty much a no-brainer! What does a funnel mean in marketing? The definition of a marketing funnel is the process of a customers journey from their first interaction with your brand to returning as a loyal customer. The end goal of any marketing funnel is sales. Read more about the marketing funnel definition. When marketers refer to the top of a marketing funnel, they’re talking about the creation of a hook that attracts people to read about their business. This is the first step in the marketing funnel process. Find out more about the top of the marketing funnel. The concept of full funnel marketing is the completion of a marketing strategy that generates leads and converts them into loyal customers. It’s one single flow of experiences that result in a prospect making a purchase from your brand. Find out more about full funnel marketing. A squeeze page is a landing page designed to capture data from a potential customer for retargeting purposes. The goal of a squeeze page is the convince, capture and otherwise, “squeeze”, a visitor into handing over their details in return for a product. Read more about what is a website squeeze page. If you are serious about making money through online sales, then yes, you need a marketing funnel. It’s a way of organising all your marketing activities into a logical, targeted and successful approach. Everything is in one place and you can monitor your visitor’s behaviour. Read more about do I need a sales funnel. How to create an affiliate marketing sales funnel? Promoting an affiliate product is hard work. Having a funnel that automates the entire sales process is going to make your life easier – from your audience’s first interaction with the product to purchase, everything is accounted for! Read more about affiliate marketing sales funnels. What is a B2B marketing funnel? The B2B marketing funnel is a way for businesses to fully understand their target audience. When you’re promoting a product or service to a business owner they need to buy into you as well as your brand. Find out more about the B2B marketing funnel. 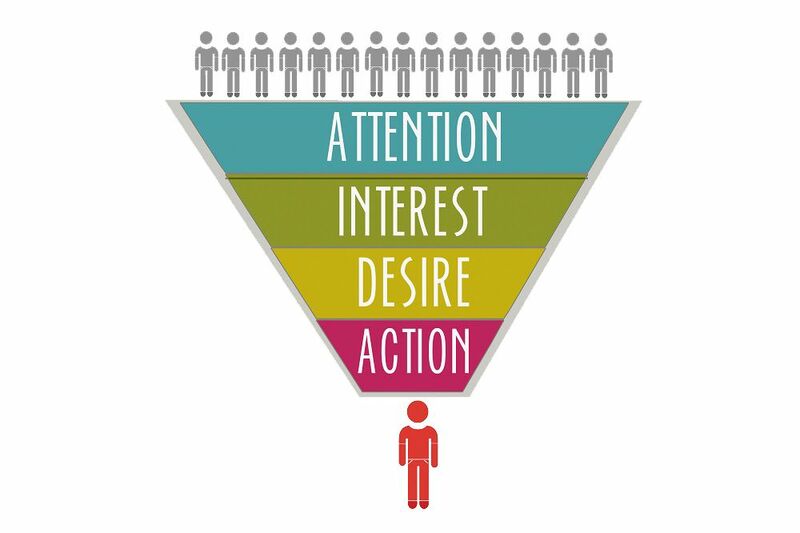 What are the essential marketing funnel stages? The three main essential marketing funnel stages are lead generation, lead nurturing and sales. Within these three stages, there are more specific processes you should aim to carry out to the best of your ability. The overall goal is to turn your prospects into customers. Read more about marketing funnel stages. What is conversion funnel marketing? Conversion funnel marketing accounts for every stage of the buyer’s journey from their first interaction with your brand through to becoming loyal customers. The conversion marketing funnel is often split into three sections to determine the best strategies to increase conversions. Read more about conversion funnel marketing. What is meant by an inbound marketing funnel? The inbound marketing funnel refers to the process of attracting leads and prospects to your company before they make a purchase. It’s one of the most cost-effective ways to boost your conversion rate while retaining the attention of potential customers. Read more about the inbound marketing funnel. Are there digital marketing funnel success stories? The digital marketing funnel is an automated process that allows businesses to bring in sales even as they sleep. Many companies, known as two comma club members, have made millions using humble digital marketing funnel templates. Find success creating a digital marketing funnel for your business! How does social media fit into funnels? Social media can play a crucial role in engaging with your potential customers and guiding them into your funnel. You’ll be able to create targeted, highly relevant content that speaks to your audience without appearing sales-y. Read more about social marketing funnels. How do you create high-converting funnel content? The definition of a content marketing funnel is creating highly persuasive content that drives people along a journey to finally make a purchase with your company. All content should consider the needs of the audience to ensure interest in retained. Read more about the content marketing funnel. What are the benefits of marketing funnel automation? Marketing funnel automation means you can keep increasing your conversion rates, without having to carry out all the repetitive and mundane tasks. Read more about marketing funnel automation and the benefits for your business. What are the top online marketing funnel mistakes? Spotting holes in your online marketing funnel isn’t always easy. The top online marketing funnel mistakes often include pushing people for a sale too soon, seeling features rather than solutions and letting prospects go. Read more about online marketing funnel mistakes. What marketing funnel template generates maximum results? There are many marketing funnel templates you can purchase online. However, for proven multi-million dollar templates, there’s no better place than Clickfunnels. You can download templates free of charge or pay for premium marketing funnels. Click to find the best marketing funnel template for your business. What is the best funnel software? Clickfunnels has everything you need to market, promote and sell your products online. It’s the best funnel software on the market, and it’s completely free for a limited time only. Get your ‘Free 14-Day Trial’ to try before you buy! Clickfunnels is an online funnel builder that gives you the ability to craft pages that are designed to convert readers into loyal customers. Every element of the marketing process can be managed in this space, from hosting, landing pages and email responders that all work in unison. Want to know more? Read more on what is Clickfunnels. The basic Clickfunnels cost is $97 per month. The Etison Suite is priced at £297. However, you can get a free trial of Clickfunnels right here. Members will receive exclusive training and resources to help them set up, manage and monitor their funnels. Click to find out more about Clickfunnels Pricing. Design a landing page featuring a single product. Give an upsell of an offer. Offer a downsize offer, too. Find out more about how to create a sales funnel. How do you share a funnel in Clickfunnels? It’s possible to clone, duplicate and save your funnels in Clickfunnels. Copy and share the funnel URL. Read more about how do you share a funnel in Clickfunnels. How do you get Clickfunnels for free? Clickfunnels is a landing page builder that considers the entire sales journey from the first click through to multiple conversions. There is a Free 14-Day Trial available that gives you access to proven multi-million dollar funnels that you can use! You can try before you buy the software. Don’t like what you see? You can leave, without paying a penny. Read more about the 14-Day Clickfunnels Trial. What is the Clickfunnels marketplace? The Clickfunnels marketplace is the world’s first ever marketplace for funnels. You can buy and sell market-leading funnels that are designed specifically for certain niches and industries. Read more about the Clickfunnels marketplace. Russell Brunson is the founder of Clickfunnels. He creates videos, podcasts and content around funnel marketing. Find out more about who created Clickfunnels. Customer Relationship Management (CRM) is a small part of Clickfunnels. It enables you to manage a relationship with your audience through campaign tracking software. Clickfunnels is an entire funnel building platform that includes everything from design, automation and tracking. Find out more about Clickfunnels CRM. What is a Clickfunnels affiliate? Once you find success using Clickfunnels, it doesn’t stop there. Clickfunnels has an affiliate programme for those passionate about funnel building. You can generate an incredible 40% commission every month on a $97 or £297 sale. Bigfoot Digital is a proud Clickfunnels affiliate – we don’t hide behind it, either! We love the platform and it would be great for you to have the same positive experience. Find out more about what is a Clickfunnels affiliate. Should you use the Builderall or Clickfunnel software to create your marketing funnels? Builderall and Clickfunnels both offer services for you to effectively create marketing funnels. So it is difficult to decide which software to use. Builderall takes the approach of offering as many digital marketing services as possible, not just funnels. For example, you can do anything from creating a marketing funnel to designing your own app. Whereas Clickfunnels take a ‘less is more’ stance. They offer a focused, detailed and effective marketing funnel and email marketing service. If you need talking through more information about the features offered by the two pieces of software, read through our Builderall vs Clickfunnels debate. Hopefully, we can help you decide which software would be better suited to your business. Should you be using Kartra or Clickfunnels for your funnel marketing? Kartra is another software very similar to Clickfunnels in terms of what you can achieve. However, with Clickfunnels, you get your results a lot quicker. This is because Clickfunnels is suitable for people with any amount of experience to use easily. Kartra also has a much smaller community due to Clickfunnels being established for a number of years now. This is proven by the increasing number of Clickfunnels affiliates. Karta taccles marketing funnels from the opposite direction. Users must envision their end goal and work backwards from the final ‘thank you’ page. This may work in some cases but it makes the software a lot less accessible and prevents users from getting stuck straight into their funnel creations. For more information about which of these softwares would suit you, visit our Kartra vs Clickfunnels page. Should you use Kajabi or Clickfunnels as your digital marketing tool? Kajabi and Clickfunnels are two marketing platforms, but aimed at different audiences. If you are selling your knowledge or a purely digital product, then Kajabi may be suitable for you. However, Kajabi could be limiting as there is no opportunity to incorporate physical products, if you should wish to. Clickfunnels offers far more opportunity as users can pretty much sell whatever their heart desires. Digital or physical… there are no limits. Kajabi offer some great features for selling online courses or online events, however unless you have significant expertise to sell, it wouldn’t be right for you. If you would like some more information about the differences between these two, read our Kajabi vs Clickfunnels post. Would Leadpages or Clickfunnels be better suited to your business? It is debatable whether Leadpages can be considered a Clickfunnels alternative. This tool offers far less than Clickfunnels, as you can only create the initial landing page stage of your funnel. The main aim of Leadpages is to generate and capture leads. You would therefore have to use another software to build up the rest of your funnel. Clickfunnels allows you to take your marketing funnels a lot further by allowing you to create email campaigns too. For more information about the Leadpages vs Clickfunnels debate, visit our post. Should your business use Shopify or Clickfunnels for your funnel marketing? Shopify is a platform for users to build fully-fledged online stores. You can sell a range of different products successfully, however, there are far fewer features for really selling. Clickfunnels takes a more direct approach to sales with their funnels using engaging content and offering visitors one option only – buy or leave. You can sell multiple products on Clickfunnels too, as the standard package provides you with three domains. If you need more information about Shopify’s features in comparison to Clickfunnels, visit out Shopify vs Clickfunnels post. Are there any worthwhile Clickfunnel alternatives? Clickfunnels presents guaranteed sales solutions for your business. Its wide range of tools and tried and tested pre-built funnel templates mean that anyone can be successful using the platform. However, it is still important to understand the potential Clickfunnels alternatives out there. Clickfunnels can even be integrated with other pieces of software, so you can reap the benefits of a number of available tools! Some of the main Clickfunnel alternatives are Kartra, Leadpages, Kajabi, Builderall and Shopify. If you would like to find out more about these, we talk you through them on our Clickfunnels alternative page. Closing thoughts on funnel marketing! Our closing thought would be, go for it. Sign up to Clickfunnels. It’s not just another run-of-the-mill marketing tool. Personally, we would never recommend a product that we don’t feel strongly about, and that we wouldn’t purchase ourselves. With over 20 years’ experience working in the digital marketing industry and with access to many marketing tools, we’re happy to give Clickfunnels our professional stamp of approval. This software is the most comprehensive landing page builder on the market. We have our own Clickfunnels subscription outside the affiliate programme. We believe in the software, which is reason enough for us to wholeheartedly recommend it to others. Plus, you get a free 14-day trial in case it’s not for you. Not happy? You can leave, without paying a penny. If you have any questions about the software, then drop us a line on 01226 720 755 and we’d be happy to give you any feedback based on our experiences. Signing up to new software online is a big decision, so it helps to have a second opinion to clinch the deal.